I hope your heart will warm as mine did when I read this from my friend Courtney. She didn't intend for it to be a poem, but it sounded poetic to me so I gently arranged the lines of her words so you could slow down your pace and remember, perhaps, the day you also got "the call." How has life changed for you since then? Do you think that someday you too, will begin to no longer dread the jangle of the phone and it's news? And maybe... even anticipate... some news of life? the call came that changed everything. The call that shakes the ground you stand on and your legs give out. My call was 29 months ago. i began to wait for the phone to ring. no longer a life taking call. In the days of waiting for a little one, i realized how beautifully God was redeeming and restoring... what once brought panic now brings anticipation, what once brought news of death now brings life and a new beginning. It is with much gratefulness and humility i can say I GOT THE CALL! 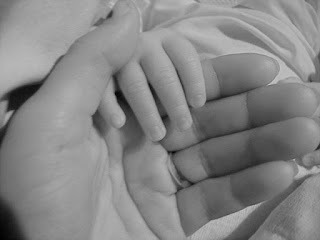 And now i have the blessing of caring for sweet baby "B",who was born on Christmas day. This is a journey that has stretched me in more ways than i know but watching the way God moves in the unknown and the waiting has revealed his grace,sovereignty and faithfulness more than i deserve. ~ Courtney F.